"Take a bite out of Time"
Hurricanes Change the Landscape Below the Ocean Too! This paper talks about the impacts that hurricanes and development can have on the plants and organisms that live in shallow landscapes under the sea. Hurricanes have the power to completely transform the shallow marine environment in the few short days it takes for it to move over an area. The high winds and torrential downpours plus local water depth and the strength of an organism’s attachment to the seafloor all contribute to how much damage the hurricane will ultimately cause. These storm conditions have different effects on the organisms which live on the seafloor. For example, seagrass meadows will suffer from things like defoliation, exposure of its root systems, burial, or death caused by a decrease in water quality. Small coral colonies are also negatively affected by either being smothered by sand coverage or in some cases having their branches broken off by strong waves. After the damage is done, the question then becomes whether or not the community can recover. In the Caribbean, macroalgae, the technical term for seaweed, can take anywhere between three weeks to eight months to recover from a storm. Seagrass can take up to a year, and coral reefs may not recover at all. After the coral dies, the reef can switch over to what is called an “alternate state”, which is when the reefs are mostly covered by various types of seaweed. This dominance of seaweed prohibits the corals from returning and is not good for the local ecosystem. The current rate for a hurricane in the Mexican Caribbean varies greatly from one every seven and a half years to one every 18.5 years. In the Atlantic, the number of hurricanes each year has increased since 1995 and is expected to increase into the future. In 2005, Cozumel was hit with two major hurricanes, Emily and Wilma, within just three months of each other. Because of the different recovery rates of marine organisms we just discussed, having two major hurricanes within a short amount of time can be ecologically devastating. This study focused on the changes of seafloor organisms after Hurricane Emily, a Category 4 hurricane. During September through November 2004 (a year before Emily), the authors of the paper created a Geographic Information System (GIS) map of the island with areas delineating various shallow marine environments. These areas, or “polygons” as they are called, were then investigated by divers to obtain estimates on the percent of cover of the nine seafloor types to be studied (Fig 1). Two months after Hurricane Emily, 71 of the sites were re-visited before Hurricane Wilma. The data they were most interested in was the difference in seafloor percent coverage before the storm versus after. 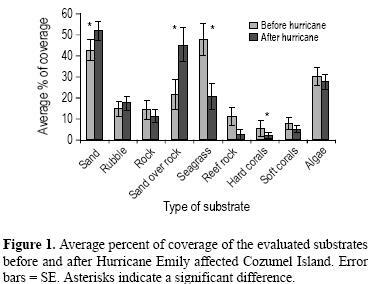 While all of the seafloor types they were monitoring differed after the hurricane, only four could be considered “statistically significant”: Sand (increased by 22%), Sand Over Rock (increased by 109%), Seagrass (decreased by 56%), and hard coral coverage (decreased by 63%). The increase of “Sand” and “Sand Over Rock” calls attention to the risk of artificial beaches. Developers frequently create artificial beaches for tourists which offer more sand than nature had intended. This excess sand is suspended and transported to nearby coral reefs during storms, smothering the coral. However, this new sand cover offers a great environment for the seaweed to establish itself on creating the potential for the “alternate state” mentioned earlier. On the south side of the island, shallow sites were less affected by the hurricane because of highly developed coral reefs. This reiterates the fact that coral reefs are great natural barriers that help reduce severe wave action. Properly managing tourist activities that add sediment to the water column is vital to maintain healthy, natural breakwaters. Unregulated tourism activities coupled with the increase in abundance in macroalgae caused by hurricanes (relative to the other seafloor types) could be enough to cause beautiful coral reefs to turn into large, rocky areas covered by seaweed. Good management, environmental regulations, and proper coastal planning carried out by Cozumel’s officials are needed to avoid this disastrous scenario and ensure that the reefs remain healthy for a long time to come.